King Vajra was the son of Aniruddha. So he was the great grandson of Lord Krishna. Vajra had 16 Deities of Krishna and other gods carved from a rare, imperishable stone called Braja and built temples to house these Srimurtis in and around Mathura so as to feel the presence of Lord Krishna. These are Vajra’s 16 Deities he installed in Vraja. 6. Sri Gopinath, who is now in Jaipur. 8. Sakshi Gopala, who is now moved to the town of Sakhi Gopal, Odisha, near Puri. 16. Yogamaya Devi at Vrindavan. At the time being this is what we know of Saksi Gopala before His pastime with the Vidyanagara brahmanas. Once there were two Brahmins (priests) from Vidyanagara in South India, who decided to make a long tour of the various holy places of pilgrimage in Northern India. After a long time the two pilgrims reached Vrindavana, the sacred place of Lord Krishna’s pastimes. They took their bath in the waters of the holy Yamuna River and visited such holy places as Govardhana Hill, together with all twelve forests of Vrindavana, eventually arriving at a great temple where gorgeous worship of the Gopala Deity was performed. Gopala is Lord Krishna in His eternal form as a cowherd boy. The beauty of the Gopala Deity stole away their minds, and feeling great happiness, they remained there for two or four days. In those days it was the custom to honour any promise made in front of the Deity, and, in any village, matters of dispute would always be settled in the temple, for no one would dare tell a lie before the Deity. So, entering the temple of Lord Gopala and coming before the Deity, the elderly Brahmin said, “My dear Lord, please witness that I have given my daughter to this boy.” Then the young Brahmin addressed the Deity, saying, “My dear Lord, You are my witness. I shall call for You to testify if it is necessary later on.” Weeks passed by, and eventually the two Brahmins arrived back in Vidyanagara, both going to their respective homes. The elderly Brahmin immediately said, “If Gopala personally comes here to bear witness, I shall surely give my daughter to the young Brahmin.” The son also agreed. We should note that whereas the elderly Brahmin was hopeful that Gopala would actually come, and thereby uphold the promise he had made, the atheistic son thought, “It is not possible for Gopala to come and bear witness.” Thus both father and son were in agreement. When the townspeople heard of Gopala’s arrival they were struck with wonder. They went to see the Lord and offered their respectful obeisances to Him. Everyone was very pleased to see Gopala’s beauty. Thus in the presence of the townspeople, Lord Gopala bore witness that the elderly Brahmin had indeed offered his daughter to the young Brahmin. Soon afterwards the marriage ceremony was duly performed. When the King of that country heard of this wonderful story, he also came to see Gopala, and constructed a nice temple for the Lord. 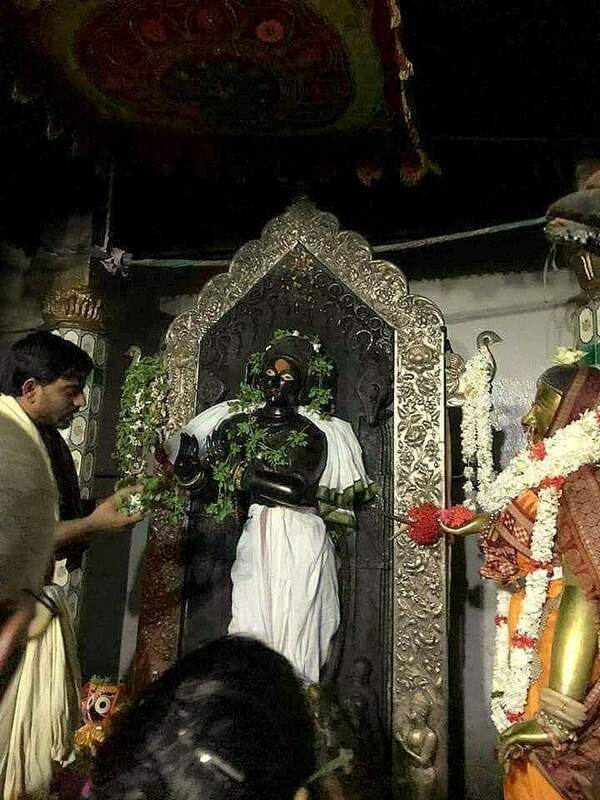 Although some time later the Deity of Lord Gopala was moved from Vidyanagara to the town of Cuttak in Orissa, He is still visible for all to see, and is famous as Sakshi-Gopala (the witness Gopala). It is now near Jagannath Puri.